This course gives you the skills and practical competence needed to work in a dental surgery. You will learn about the day-to-day running of a dental practice and acquire the qualifications for entry to the Dental Council Voluntary Register of Dental Nurses. Dental Nursing: The course for you? If you have an interest in working as part of a dental team in the delivery of oral healthcare and have a caring and understanding disposition, this may be the course for you. Skills required of students considering dental nursing include communication and organisation skills, the ability to use initiative, and the ability and willingness to work closely with the dental team in providing support and assistance during the provision of dental treatment. The dental nurse may also be involved with the administration of the dental surgery. Through the course you will be able to develop good patient skills and learn to communicate effectively in a healthcare environment. 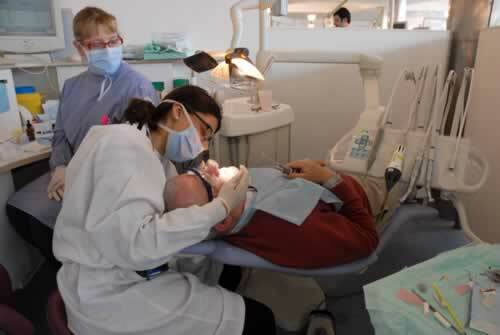 This two-year course is based in the Dublin Dental University Hospital beside Trinity’s campus. Clinical facilities are of a very high standard and class sizes are small, so that students receive considerable staff input into their progress throughout the programme. The course is very practical throughout, allowing students to progressively develop practical clinical skills. Graduates of the Trinity School of Dental Science and Dublin Dental University Hospital (DDUH) are highly sought after due to the extensive clinical exposure obtained during this programme. As a graduate of Dental Nursing, you will be able to find work in a variety of working environments, including dental hospitals and Health Service Executive dental clinics, as well as in general and specialist dental practices. Depending on the work setting, advancement in the field may include senior dental nurse, clinic nurse manager, practice manager, marketing representatives for relevant companies, dental nurse tutor, course co-ordinator, lecturer in dental nursing, and the area of health promotion. Further courses of study are available to dental nurses, including the Diploma in Orthodontic Therapy. The Diploma in Dental Nursing course is divided into practical and academic components. Both academic teaching and practical clinical experience are gained at the Dublin Dental University Hospital (DDUH) at Trinity. Dental Nursing students attend DDUH from Monday to Friday, from 8.30am to 5pm, but there will be opportunities to enjoy university life at various times during the week. The first year will be a combination of lectures and clinical practice, which will provide students with a variety of learning opportunities. In the second year of the programme, the students will have the opportunity to work with various dental clinicians in a wide variety of disciplines. Clinical experiences will be gained within the DDUH environment, external institutions and private practices. First year is assessed by written examinations, practical examinations, continuous clinical assessment and an oral presentation. Second year is assessed by written examinations, objective structured clinical examination (OSCE), a portfolio of clinical experience, case study written report and an oral presentation. Applicants are required to present six subjects including English, Mathematics, and one of Physics, Chemistry, Biology, Agricultural Science or Physics/Chemistry. Of the six subjects presented, two must be of a standard of at least grade 4 on ordinary Leaving Certificate papers. The remaining four subjects must be presented to a standard of at least grade 6 on ordinary Leaving Certificate papers. Applications may also be considered from mature applicants who do not satisfy the academic entry requirements but can demonstrate appropriate experience relevant to the course.